With the new semester 2 weeks ahead, Kookmin*People wanted to enjoy the end of their summer break. During semesters, they vaguely thought ‘of traveling around the attractions in and out of the country in their vacations because the pressures of tests and assignments. However when the time for vacation comes, they are satisfied with watching a travel program while lying down on a couch. Thus, we left to ‘Peru,’ an unfamiliar country that was introduced by three musicians Hui-yeol Yu, Sang Yun, and Jeok Yi from a cable travel program. Where is Peru located? Peru is where the lost flying city and face of Latin America ‘Machu Picchu’ exists. For the Kookmin*People who wanted something special before the end of the vacation, it is the secret place where you can enjoy the culture and food of Latin America. It is the last chance to travel for those who traveled in other countries by watching a TV travel program. Now, the Latin American Cultural Center is here. Latin America is often referred to as South America. This area indicates Mexico and Central America as well as countries around the Caribbean Sea and the South American Continent except for Canada and U.S. in the North America. 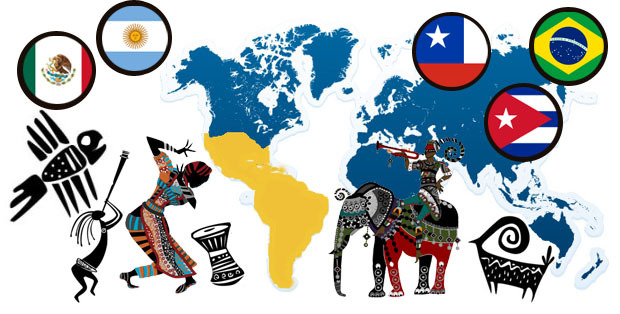 The representative countries located in Latin America are Mexico, Brazil, and Argentina. The total area of Latin America is approximately 20.55 million km2 (93.5 times that of the Korean Peninsula) and it constitutes 15% of the world’s total area. Latin America is composed of 33 sovereign states (8 countries in Central America, 13 countries around the Caribbean Sea, and 12 countries in South America) and colonies of the U.K., U.S., France, and Netherlands at the northeast of South America and Caribbean Sea; thus, international organizations such as UN officially use the name Latin America and the Caribbean Countries. Except for Brazil that uses Portuguese, most states (18 countries) use Spanish while other states use English (12 Caribbean countries), French (Haiti), and Dutch (Surinam). 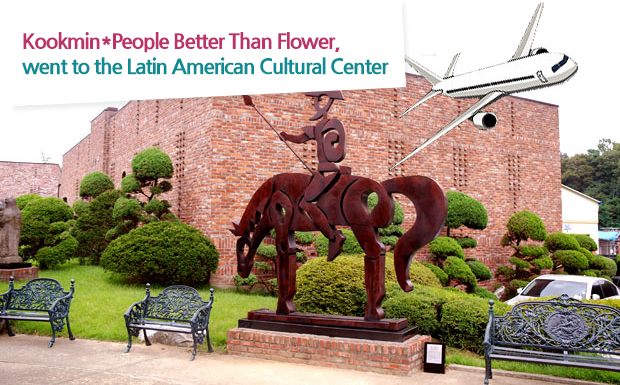 In the Latin American Cultural Center, there are various spaces available including historical and art museums, religious exhibition hall, and sculpture park. 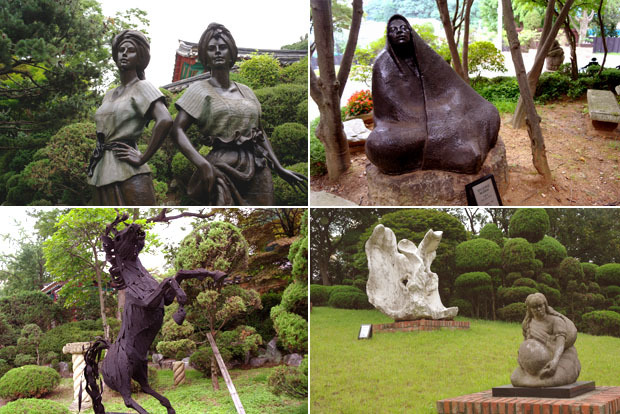 As you step into the cultural center, the sculpture at the front garden of the museum draws your attention. 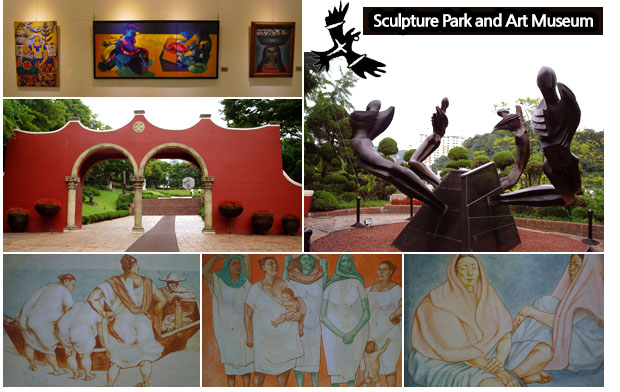 It is possible to see sculptures of various Latin American countries such as Spain, Mexico, and Peru. Also, Latin folk music is played everywhere to create the sentiment of the Latin American culture. People in Latin America are said to enjoy music and dance in their daily lives. The unique feature of their music is derived from the harmonization of the natives’ traditional and European musical instruments. 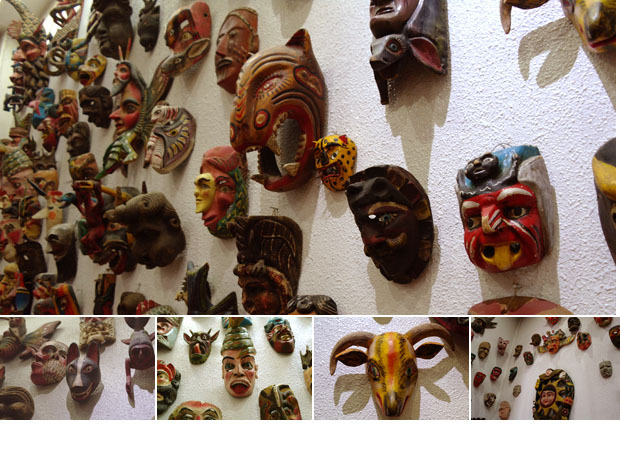 Especially, fancy masks are exhibited on the walls as well as ceiling of the Mask Exhibition Hall. The variety of masks painted in prime colors welcome with funny expression. Apart from those with human shape, there are various masks shaped in animal, angel, and devil. The mask culture of Mexico originated from the connection of soul with the various shapes of symbolic masks among Indio. The Totonac Indio of Mexico tried to liberate their daily lives by covering their faces with a mask. It is based on the belief that a mask is another identity. Diverse masks were used for festivals, carnivals, and rituals. The most interesting thing is that there is no mouth in the ‘mask of death’ as a dead man tells no tales. In the Art Museum, various artworks of Latin America are exhibited. Flowers, plants, and women from tropical area show off intense colors. Besides paintings, colorful handcrafts and mirror crafts are exhibited as well. In the sculpture park outside the museum, more dynamic artworks can be seen. A big Mexican sculpture under the name of ‘the Four Wind’ is certainly a sight to behold. The red arch at the entrance of the sculpture park adds the exotic impression of the cultural center. 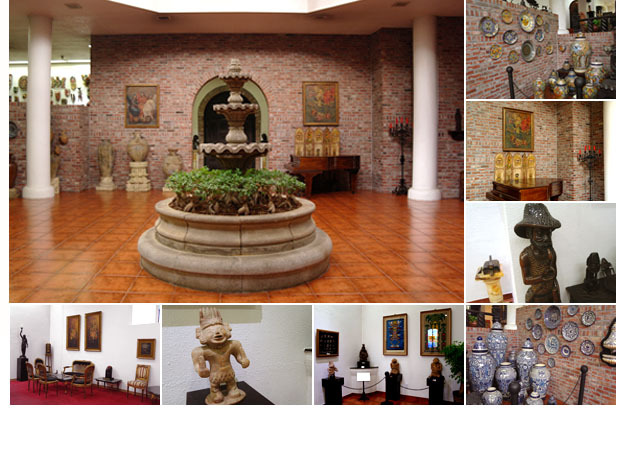 One thing noticeable in the cultural center is the baroque style religious exhibition hall, Capilla. The baroque style exterior and richly decorated interior reflect the ‘baroque style of Latin America.’ The interior of Latin cathedrals is characterized by sculptures of Mary instead of paintings. The ceilings and walls are decorated in fresco whereas the corridors are adorned with stained glass, cross, and religious paintings. Especially, the high altar that was installed at the religious exhibition hall of the cultural center is a representative artwork of the best Latin American religious artist A. Parra (Mexico). His artworks are actually used in the Vatican. As we sit in this holy space while listening to the music, our mind becomes pious. After touring the museum, arts museum, sculpture park, and religious exhibition hall, you may feel hungry. The Latin American Cultural Center operates a restaurant for visitors and it is no surprise that it provides the traditional food of Latin America. 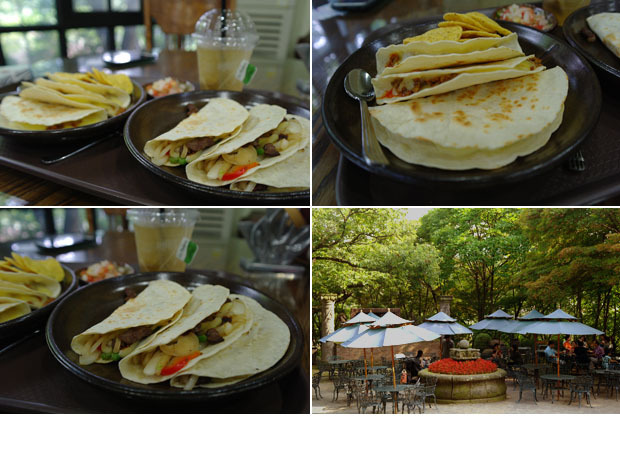 Taco, a traditional Mexican food, is also loved in Korea. Beef, pork, onion, and pineapple wrapped in corn Tortilla are enjoyed with Mexican sauce. Quesadilla is a dish that adds cheese to Tortilla. Also, it is possible to taste traditional Mexican tea and Paella that originated from Spain. Let’s enjoy Latin American food with Latin music at the outdoor restaurant. Of course, Latin America is still unfamiliar; however, we have consistently made amicable relationship with the countries in Latin America. Colombia joined in the Korean War in 1950 and numerous countries including Mexico provided medical supplies and supported relief operations. These countries have preserved the passion and splendid culture amidst the painful history under colonization. It is recommended to visit Latin America for those who haven’t had a chance to travel during the vacation. Including relics from Maya, Aztec, and Inca, various artworks, sculptures, and decorations are available. When you experience the splendor and versatility of the Latin American Cultural Center surrounded by Latin music, you will be able to overcome the sense of emptiness at the end of vacation.